❤ DIY. By this wooden planter box, you can DIY an enchanting miniature fairy garden project easily with succulents like sincle small aloes or hen and chicks.Have great fun. ❤ There is no drainage at the bottom, so when you water your succulents you'll want to use a spray bottle and mist them. 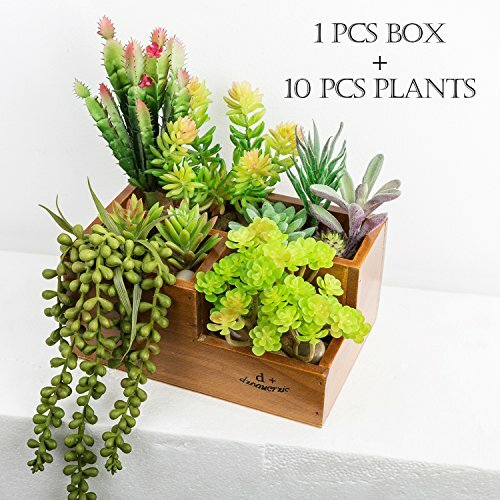 This fake succulent plants set includes ten fake succulents each one in a different design and it with a 3-Grid Wooden Succulent Flower Planter Box. Each plant when sold individually costs from 3-8, the box sold individually costs about 15. This set will save you about 20. A set containing artificial succulents, but vividly realistic, succulent plants, individual Wooden box with various succulent types. Faux succulents, plants and soil are made of plastic.Perfect for succulents like sincle small aloes or hen and chicks. Perfect gift for office, home, shopping mart, hotel, bar, balcony garden, home gardening decorations. If you have any questions about this product by CHICVITA, contact us by completing and submitting the form below. If you are looking for a specif part number, please include it with your message. Yorkshire Window Box color: White, Size: 36"
Panacea Quatrefoil Window Box, 36"